All our Kiddy experience, expertise and technology has gone into producing an outstanding Group 1/2/3 car seat which has performed extremely highly in tests done by independent testing houses such as ADAC, TCS, Which? and ÖAMTC. This makes the Kiddy Guardian Pro 2 the best Group 1/2/3 car seat for all round protection for your child, from 9kgs to 36kgs (approx 12 months old to 12 years old) with far superior safety protection than typical 5 point harnessed car seats and Extended Rear Facing (ERF) seats. The Kiddy Guardian Pro 2 grows with your child in height and width, to ensure the perfect fit, for the best protection, as they grow from toddler to pre-teen. 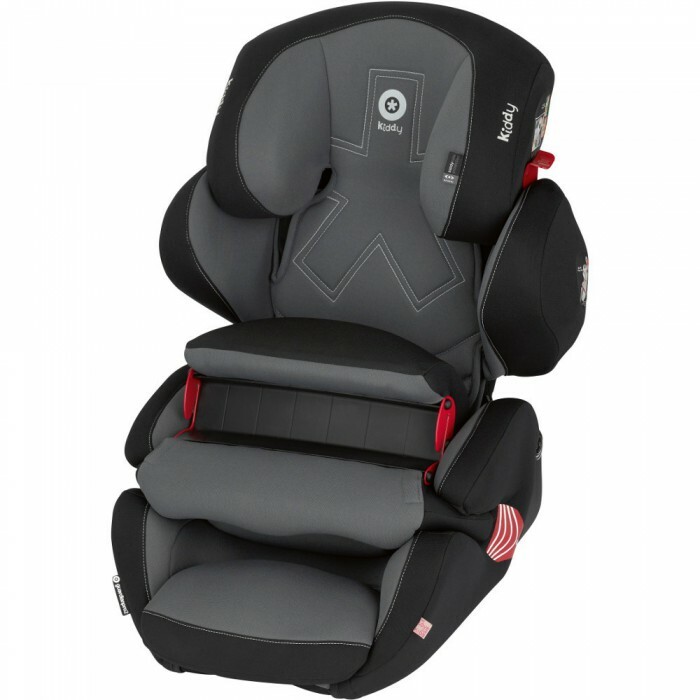 This child car seat is designed to ensure everything is easy for you, and comfortable for the child. The Kiddy Impact Shield is designed to protect the upper part of a child’s body from severe injury in the event of an impact. High tech materials have been used to give optimum side impact protection to the head and shoulder area. The Kiddy Guardian Pro 2 seat has a patented built in shock absorber, which has been constructed using car ‘crumple zone’ technology. This unique shock absorber effectively absorbs the forces created in an impact, thus deflecting them away from the child, and reducing the risk of pelvic injury. There is no seat that is quicker or easier to fit for any child over 9kg, because there is no fiddly harness to adjust. Simply decide whether the child’s weight requires the protection shield or not; adjust the back height with one hand; and route the seat belt into position; then off you go! A great light weight seat for anyone who needs a quick swap between children or cars.